The Alliance of American Football will launch its inaugural season on Saturday, February 9 and fans will be able to experience all game action on NFL Network, CBS, CBS SN, TNT, and B/R Live. The Alliance is proud to partner with top media programs in order to bring more football to fans this season. Following The Alliance’s opening weekend, NFL Network will air two games per week in prime time on Saturday and Sunday night. 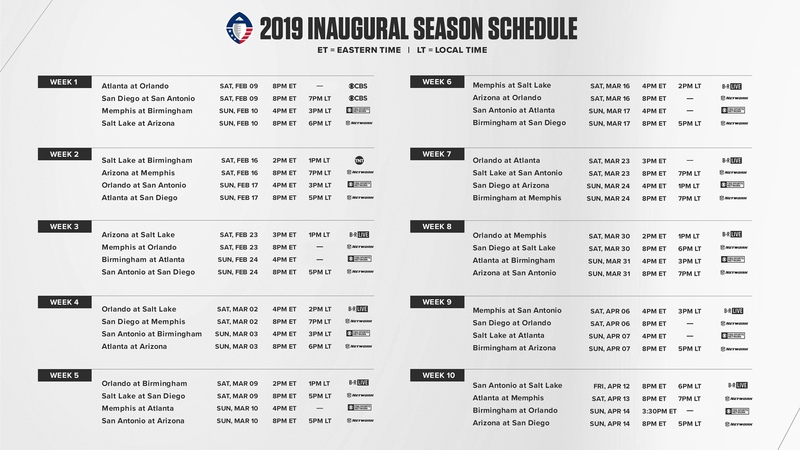 The Alliance of American Football opens its inaugural season the weekend of February 9-10, with a pair of games on both Saturday and Sunday. Turner Sports and The Alliance of American Football have announced a multi-year, cross-platform partnership that will include live event coverage extending across a combination of Turner Sports platforms TNT and B/R Live, Turner Sports’ premium sports streaming service. TNT will exclusively televise one Alliance regular-season game and one playoff game each season throughout the length of the agreement, with additional regular season games available weekly via B/R Live.